I have put off writing this review for so long - two months actually - hoping that some new insight would occur to me to explain why I felt the way I did about this book. So many people, including several whose opinions I highly respect, loved Never Let Me Go and I just didn't. Perhaps it's one of those books, like Ender's Game, that I just have to read again to fully appreciate. But I don't really want to. It was just so...hopeless. (**spoiler alert**) One group of people being dehumanized by another, and in this case literally being used for spare parts. It's happened over and over again in history and is still happening today. Do we as a species seriously never learn? "After the war, in the early fifties, when the great breakthroughs in science followed one after the other so rapidly, there wasn't time to take stock, to ask the sensible questions." (Reminds me of the line from Jurassic Park: "Your scientists were so preoccupied with whether they could that they didn't stop to think if they should.") There's always time to ask the sensible questions, to think about the implications, to consider the possible ramifications. At least there should be for sentient beings with enlightened self-interest. Maybe I just prefer my futuristic fantasies to have a bit more optimism to them, like Star Trek boldly going where no one has gone before. Ok, so that's not entirely true, because I'm a fan of the Hunger Games series and that's pretty bleak and big on the dehumanization of one group by another. Maybe it's the placid acceptance by the students of their fate that rattles me, their seeming willingness to remain "in the shadows" where society wants them to stay hidden. Rage against the machine! Fight for your right to be recognized as fully human! Don't just lay down and take it! Maybe the story hit too close to home with the depressing sense that nothing ever really changes, it just cycles around and around and back and forth. "You have to accept that sometimes that's how things happen in this world. People's opinions, their feelings, they go one way, then the other. It just so happens you grew up at a certain point in this process." But I don't really believe that, though I occasionally get frustrated with the slow rate of changes I want to see happen; I believe we are progressing and growing. Slowly - so, so slowly sometimes - but it happens. Maybe it's simply the fact that I read it on my Kindle and that often seems to make my reading flow less smoothly. 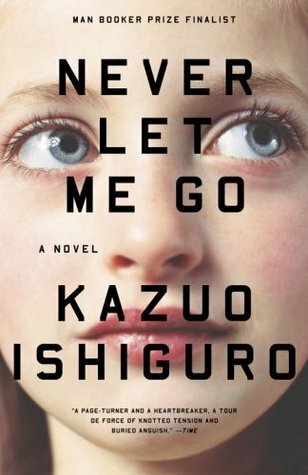 For whatever reason, Never Let Me Go was not the enjoyable, meaningful read for me that it was for so many others. Hee...I feel the same way about Shannon Hale's books: why does everyone else love this stuff when I can barely make it through the dang thing without throwing it? By happenstance, you finished this on the same day as another Spokane friend (one of the Steen girls), so your reviews are right above each other in my Goodreads news feed--she loved it and gave it five stars. Taste...it's a funny thing.